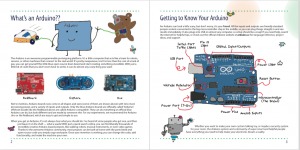 A New Book For Kids of All Ages! Written and illustrated by young Maker Movement sensation “Super-Awesome” Sylvia, Sylvia’s Super-Awesome Project Book: Super-Simple Arduino shares the power of Arduino microcontroller programming with learners of all ages through exciting engineering projects. Sylvia’s whimsical graphics and clever explanations make powerful STEM (Science, Technology, Engineering, and Math) concepts accessible and fun. 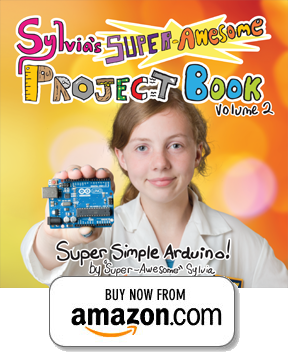 Super-Awesome Sylvia is a kid who loves making, tinkering, and art. 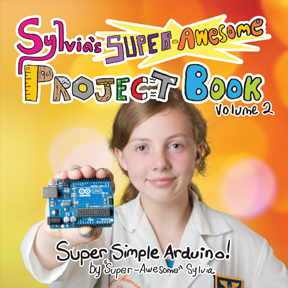 Her online video series, Super-Awesome Sylvia’s Super-Awesome Maker Show, has millions of views. 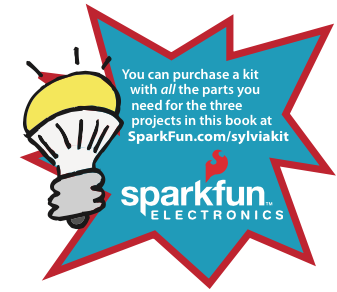 In this super fun book, Sylvia teaches kids to understand Arduino microcontroller programming by inventing an adjustable strobe and two digital musical instruments you can play! 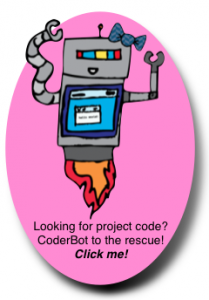 Along the way, they will learn a lot about electronics, coding, science, and engineering. Want to be on the list for more super-awesome news?